Find more reviews like that on Books Unbound.Firelight is one of those books who was praised on many internet sites even before it was released which made me really curious but also skeptical. The cover was the first thing I´ve noticed on this book and after reading the short description I was definitely interested and had to preorder it so that I had it in my mailbox on the release day.The next 2 days I was unreachable because in every free minute Jacinda, Will and Co were calling for my attention – justly.Firelight enhances the reader not only with a beautiful cover and chapter construction but also with a great story.Jacinda is seventeen and lives with her mother and twin sister in the Draki clan, hidden from the outside world. Her dad got killed by humans when he was in his Draki form, because the humans are the biggest enemy to a Draki – and that´s exactly where Jacinda lands in the beginning of the book.She can outrun this danger but when she arrives at home another threat waits for her and she and her family have to leave the clan of the Draki.But Jacinda soon finds out that she is also not save in the human world. But what happens when she feels drawn to the threat? What if that threat is the only thing that keeps her alive? And worse, what if she has to choose between what her clan wants, what her family wants and what she wants? Sophie Jordan takes the reader into a world full of fantasy and magic. Her characters are consistently believable (some are so believable they even made me furious). The story is thrilling throughout the whole book and to the end (and especially at the end!) 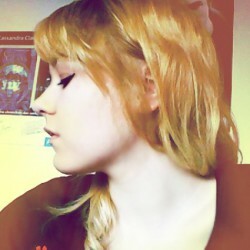 because it´s unexpected and unforeseen.It may sounds a bit like a Romeo and Juliet kind of romance at first but it´s definitely more complex than that. The discrepancy between existence and illusion of the Draki clan is described very appropriate – finally a book where not everything is sunshine and roses! 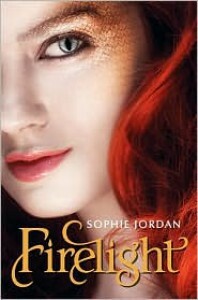 Firelight is definitely a start into a series with a beautiful forbidden romance but also a lot of tension that will keep you on the edge of your seat.Firelight leaves you with the urge to want more and that hopefully quickly.I gave Firelight 4,5 stars – keep up the good work, Miss Jordan!